Elaeocarpus dentatus , "Hinau; New Zealand Olive" (Elaeocarpaceae). Also known as whīnau (a variant of hīnau) and pōkākā (local origin). From PROTO RAROTONGAN/MAORI *Hange Geniostoma spp., (Loganiaceae). The hīnau is sometimes referred to as the "New Zealand olive" because of the appearance and quality of its fruit. It is not closely related to the olive botanically, but then neither are many other species with common or botanical names referring to their olive-like qualities. 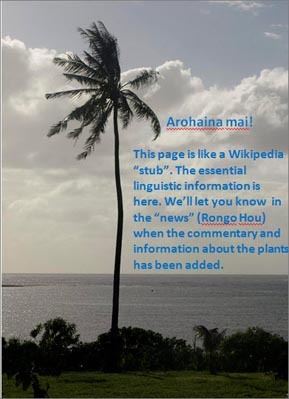 There are notes about these quirks of naming in the page about the word Ōriwa, the word acquired by Māori to denote the "true" olive (Oleaceae). The hīnau gained the designation hangehange in some districts probably because of its fragrant fruits. Hīnau - the Wonder Tree! There are not many native forest trees in Aotearoa that put on spectacular floral displays, but through the spring and summer, one of the most spectacular, the Hīnau (Elaeocarpus dentatus) will be doing just that in forest reserves from Northland to mid Canterbury and South Westland, possums permitting. In many ways, Hīnau is a wonder tree – there aren't many trees which have great flowers, interesting fruit, bark for fixing dyes, medicinal uses, good timber and fire-retardant properties, and also produce food for people, rats, pigs, birds and possums. The hīnau has all these properties. Hīnau belongs to a family of trees which is found mainly in tropical Asia, the Western Pacific, Australasia and South America. Its relative the makomako (wineberry, Aristotelia racemosa) belongs to a genus also found in Chile in Peru, but interestingly the genus Elaeocarpus (the botanical name comes from the Greek word for 'olive', in reference to the olive-like fruit of many species, including the hīnau), although far away from the most numerous in terms of species, is not found natively in the Americas. A number of species are grown here for ornamental purposes, and one, the Queensland quanddong (E. angustifolius) is regarded as an invasive menace to native flora in some of the Pacific islands where it has been introduced. Although the hīnau is endemic to New Zealand, I have seen it listed in an American plant catalogue under the name of "Japanese Blueberry"! The tree itself grows from 10 to about 20 metres tall (up to 35 m and heavy bush), with a spreading top as a forest tree, but the top is usually nice and rounded in trees out in the open. It does actually prefer a shady, moist environment; Environment Waikato recommended it as a tree to plant and damp wetland margins, but although it likes moisture, it does not like wet feet. You can grow it from seed (which stays viable for several years), or from cuttings. It doesn't like heavy frost, but can stand light ones. It was once found throughout the Waikato and in many other parts of the North and South Islands, although now of course its natural occurrence would be confined to forest remnants. Like many native trees, it has distinct juvenile and mature forms.The younger trees have long narrow leaves (up to 15 cm) with wavy margins, while the leaves of the adult are wider – around 3 cm – and a bit shorter (10 to 12 cm), with serrated edges. In mature trees, the trunk can be up to a metre in diameter. In Summer, it has beautiful sprays of goblet-shaped white flowers, which can pretty much cover the tree. These are followed in Autumn and Winter by the distinctive fragrant dark purple olive-shaped fruits, about 2 cm long, each with a single large seed. Even solitary trees will produce good quantities of fruit, if there are no possums around. Possums are real menace to this tree, zeroing in on both the flowers and the fruit. The fruit is actually good for them (it was also a favourite of the kiore, and kākā will go for it in a big way when they get the chance); ironically, in areas where this is an important part of the possums' diet and they have destroyed the flowers and thus prevented fruit from forming, they tend to lose condition and become further less fertile (there's an interesting article by D. Ramsey and others about this in the journal Wildlife Research, volume 29, number 1, April 2002). Given its positive effects on possum health and well-being, hīnau may also have a role in organic pork production. The timber is both light and tough, resistant to splitting, and good for wedges, flooring, and furniture, among other things. It also doesn't burn readily, hence the mention of its fire-retardant properties. Hīnau was a very important crop tree for Māori, who actually cultivated it in forest groves. The berries served as a stock food (for the kiore), and were the source of a kind of flour for making cakes. For this purpose they were soaked in water until they were quite soft, then powdered and sieved to separate the flesh from the skin and the stone. The pounded flesh was then mixed with a little water to form a thick paste, formed into cakes, and baked. These hīnau cakes were a highly esteemed special food, referred to in the saying "Te whatu o Poutini, he taonga whakamoe i te whare" [The eye of Poutini, a treasure hidden in the house – Poutini is a star in the constellation Orion, probably Betelgeuse, which shines brightly in the night sky while the hīnau is flowering, and is visible at dawn when the fruit matures]. Williams Māori dictionary also notes the occurrence of the phrase whatuturei a Rua (the only example, it seems, that he found of the use of of the word whatuturei), to indicate "a cake made of crushed hīnau berries, which was regarded as a great delicacy": Kia whakaoho koe i taku moe, ko te whatuturei a Rua [You should wake me from my sleep, delectable hīnau cake]. Definitely, a treat to look forward to! The bark of the hīnau was soaked in water and used as a mordant to fix the black colour produced by immersing flacks for garments and decorative work in special kinds of mud. It also has some medicinal qualities, having substances useful for the treatment of skin diseases and some stomach problems, and also sedative properties. So there you have it, hīnau, the all-in-one cropping tree: the food for man, bird, and beast -- medicine, decoration, fine timber and a firewall all bundled together and waiting to be planted in those damp shady spots where it sure to flourish. Further information : (See Bibliography). 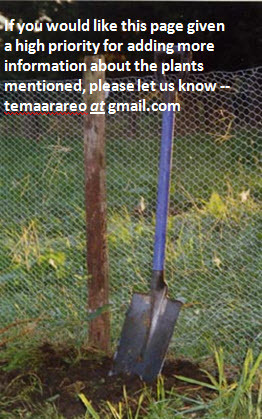 There is more information about this tree along with good photographs on the NZ Plant Conservation Network's web site.